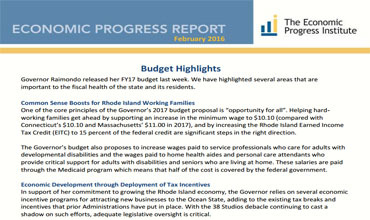 Governor Raimondo released her FY17 budget in February. We have highlighted several areas that are important to the fiscal health of the state and its residents. One of the core principles of the Governor’s 2017 budget proposal is “opportunity for all”. Helping hard-working families get ahead by supporting an increase in the minimum wage to $10.10 (compared with Connecticut’s $10.10 and Massachusetts’ $11.00 in 2017), and by increasing the Rhode Island Earned Income Tax Credit (EITC) to 15 percent of the federal credit are significant steps in the right direction. The Governor’s budget also proposes to increase wages paid to service professionals who care for adults with developmental disabilities and the wages paid to home health aides and personal care attendants who provide critical support for adults with disabilities and seniors who are living at home. These salaries are paid through the Medicaid program which means that half of the cost is covered by the federal government. In support of her commitment to growing the Rhode Island economy, the Governor relies on several economic incentive programs for attracting new businesses to the Ocean State, adding to the existing tax breaks and incentives that prior Administrations have put in place. With the 38 Studios debacle continuing to cast a shadow on such efforts, adequate legislative oversight is critical. Oversight legislation passed in 2013 sets in place criteria for evaluating the effectiveness of economic development tools (including, via amended legislation, those tools passed in 2015 at the Governor’s request). Responsibility for measuring the effectiveness and return on investment of economic development incentives falls to the Office of Revenue Analysis (ORA), which reported in January to the House Oversight Committee that inadequate staffing resources had been responsible for delaying completion of the first round of evaluations, due by June 30, 2015. The Governor’s budget proposal provides funding to support two additional staff positions at ORA. The proposed $5 million expansion of the Research & Development (R&D) tax credit is justified on the grounds of Rhode Island falling behind peer states in commercial R&D per capita. Given the comparative strength of academic R&D, and the plans to further catalyze innovation through partnerships with Rhode Island’s public and private post-secondary institutions, this expanded funding may not be necessary. Certainly making a portion of the R&D credit refundable may be both unwarranted and unnecessary. The Budget includes $12.5 million to fund HealthSource RI, the state’s health insurance exchange, which provides one-stop access to affordable health insurance for Rhode Islanders. Through the HSRI SHOP, small businesses can purchase insurance and provide their employees with choices for their health care coverage. The Budget includes $39 million in general revenue reductions in the Medicaid program, almost half of which ($19 million) is realized by the implementation of the new on-line portal for affordable health insurance and work support programs provided through DHS which is scheduled to “go live” in July 2016. Currently Rhode Islanders apply for benefits through two different systems, including the antiquated InRhodes system. The new single eligibility system provides Rhode Islanders with easier access to health coverage and other services they may need to make ends meet, improves program integrity and allows the state to maximize federal matching funds by ensuring that applicants are enrolled in the correct program. The Budget assumes modest savings from expanding the RIte Share program to require single adults (the Medicaid expansion population) to participate. Adults who have access to health insurance through their jobs, will be required to enroll in the RIte Share program, if the employer’s plan meets certain requirements. Under current law, only parents are required to enroll in RIte Share whereby the state pays the employee’s share of employer-sponsored health insurance and the employee has a Medicaid card to cover health services that are not included in the employer’s plan. Fiscal Year 2017 will be the first year that the state will contribute to the cost of Medicaid coverage for single adults (the Medicaid expansion population). In December 2015, over 63,200 previously uninsured low-income Rhode Islanders were enrolled in coverage. For FY 2017, the state share is budgeted at $12.1 million of the total $485 million cost. Coverage for other Medicaid populations is split approximately 50/50 with the federal government. The Governor proposes to require seniors and people with disabilities who need long term services and supports at home or in nursing facilities to enroll in managed care. Managed care includes a managed care health plan, a primary care case management program, community health teams and other arrangements that meet OHHS standards. Having faced high levels of unemployment throughout the Great Recession, Rhode Island has recently paid down the balance owing to the unemployment insurance (UI) fund maintained by the U.S. Treasury on behalf of all states. When states have a positive balance in the fund, they earn interest on that balance, whereas they pay interest on outstanding balances owed to the fund. In the 2007-2009 recession and its aftermath, 36 states, including Rhode Island, depleted their UI funds and were forced to take advances from the Federal government to continue paying benefits. By January 2015, half of the 36 states, including Rhode Island, had paid back the UI debt owing to the federal fund. Adjusting employers’ unemployment insurance contributions downward by about $30 million, as the Governor’s budget proposal recommends, will compromise the process of rebuilding a positive balance in the UI fund, necessary to prepare for future economic downturns.